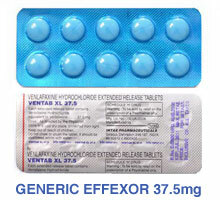 Description Venlafaxine belongs to a class of antidepressant drugs known as SSRIs, and is used to treat depression, general anxiety disorder (GAD), and seasonal affective disorder (SAD). It works by increasing certain kinds of activity in the brain. In animals, this drug has been shown to be an effective pain reliever. Studies evaluating venlafaxine for pain have shown that this drug may alter pain tolerance thresholds thereby providing a pain-relieving effect in headache or other conditions. Side effects of effexor include upset stomach, drowsiness, weakness, tiredness, excitement, anxiety, difficulty sleeping, nightmares, dry mouth, skin sensitivity to sunlight, changes in appetite or weight, and headache.